The ghost of Rosemary Woods or the Case of the Lost Tapes. Part of the defense by the Endeavor Academy legal team was that A Course in Miracles is the word and teaching of Jesus and therefore, as channeled information, is public domain. Although some case law supports that contention, it turned out not to be the strongest argument. 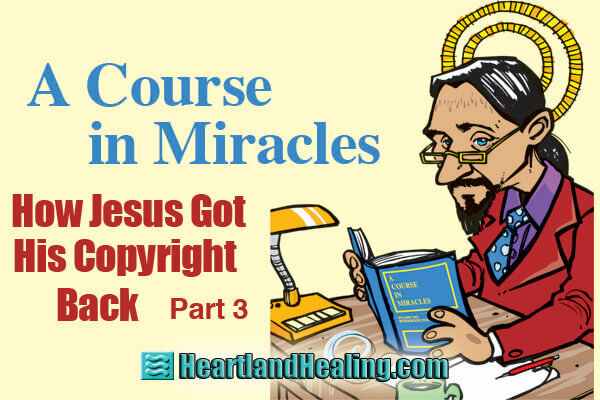 The word of Jesus wasn’t enough to fight the lawsuit brought by the Foundation for A Course in Miracles, the copyright holder. But divine intervention may have played a part. To challenge the copyright, Endeavor Academy eventually chose to assert that the copyright should be voided since so many copies of the Course had been disseminated in various forms prior to copyright filing. At least four versions existed and were distributed without restriction before the first 1975 copyrighted edition. One of the reasons Endeavor chose that defense was because of the discovery of some compelling evidence. That turned out to be the key point and it wouldn’t have worked but for two crucial pieces of evidence. One was the prior copy of ACIM given to Hugh Lynn Cayce, now called the HLC text, two years before the 1975 copyright. “Without naming names,” Whitmore demurred, “one of the publications of the Course that was a cornerstone of Judge Sweet’s opinion that the material had already gotten into the public domain was a complete copy of the Course, all three volumes, that Bill Thetford had sent to Hugh Lynn Cayce at the Cayce Institute in Virginia Beach, Va. in 1973. That three-volume set ended up in the library at the Cayce Institute where the public could view it. “From that Urtext, Thetford added headings and chapter breaks and edited out a lot of the personal material. He bound that in what are often called ‘thesis bindings’ and he sent a copy like that to Hugh Lynn Cayce. That is known as the Hugh Lynn Cayce (HLC) version [publication 3]. I think there were about six people, including two at Columbia, who got it. “The copy retrieved from the Cayce library and submitted for evidence was one of those typewritten versions. I have a photocopy of that original version. That is the version posted on the internet in December of 1999. The copyright Wapnick eventually acquired in 1999 was based on the 1975 copyright application submitted by the Skutch’s and the Foundation for Inner Peace for that Criswell printing. In the lawsuit, Wapnick, with supporting testimony from Judith Skutch, maintained that the earlier versions prior to the 1975 printing were working manuscripts that existed only in a small number. Judged Judy and the smoking tapes. Establishing that there were previously distributed copies of ACIM floating around long before the 1975 version was a crucial part of the Endeavor Academy’s defense. The copy of that HLC text was important for that. But an even more compelling piece of evidence seemed to seal the deal. An audiotape was discovered that held the voice of Judith Skutch from a lecture she delivered sometime in the 1970s. “An interesting story that involves an important piece of evidence involves Joy Steadman from Omaha. She was a member of our group, A Course in Miracles Society and she was traveling to visit her sister in Arizona. She stopped at a friend’s house, a fellow Course student, in Santa Fe. “She learned that one of the people there, a fellow named Lee, had recorded a Judy Skutch presentation about the Course in Miracles back in the middle 1970s, when the ink was still wet. Lee recalled that in that presentation Skutch had talked about all the enthusiastic copying and distribution of the Course prior to the time the Criswell text had been printed. Now, realize, that is an important point about prior distribution. “Lee thought he had a copy of that tape. Well, after a few days, he went looking and found it. “On that tape, you hear Judy Skutch around 1977 saying, ‘Oh, yeah! We printed hundreds of copies of that thing. That’s why we had to print the Criswell because the demand was so strong for it we couldn’t keep up with it at the Xerox machine. Can you imagine a nickel a page?’ The court hearing her own voice saying that was a pretty persuasive piece of evidence for Judge Sweet that there had been prior unrestricted distribution. “Lee, the man from Arizona, traveled to New York to authenticate it and that was important. In court depositions, Skutch claimed that it was just ‘sales talk,’ hyperbole. “You know, the story of this legal action is full of miracles. Finding that tape was one of them,” Whitmore smiled. Next: An Omaha-based group sends Jesus’ words in A Course in Miracles into the public domain.